Bit.Trip Presents… Runner 2: Future Legend of Rhythm Alien is the lost episode of the Bit.Trip series. It details the events that took place between Bit.Trip Runner and Bit.Trip Fate, wherein protagonist CommanderVideo is transported to another dimension – the third dimension. Yes, the series has moved to the present, discarding the endearing retro-aesthetic of its predecessors in favor of a splendid cartoon look. Along with more complex tracks, a host of new abilities, greater accessibility, and a menagerie of odd playable characters, Runner 2 is ideal runner experience. The story goes that CommanderVideo, after assembling an all-star team to assist in defeating his arch nemesis Timbletot, intercepted an attack from the dastardly robot that whisks him away to another world. So now he has to navigate the five locales this strange new place offers and return home to fulfill his mission. The plot doesn’t come up much, merely a handful of brief but fun cutscenes narrated by Charles Martinet (the voice of Mario), who delivers his lines with appropriate melodrama and suspense, making what little story there is far more entertaining than it otherwise could have been. 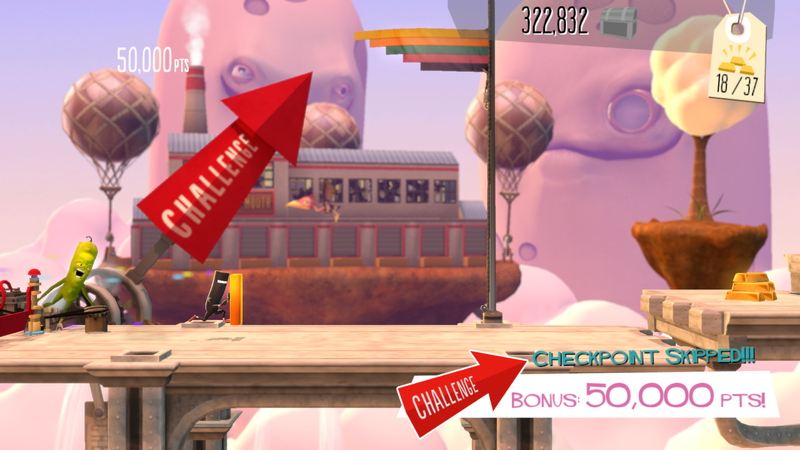 Runner 2 is a rhythmic auto-scrolling platformer. That means the character moves of their own volition, auxiliary actions like jumping, sliding, and kicking handled by you; but with a musical touch. As one of eight characters, you guide your avatar through a hundred elaborate, difficult, and above all thrilling courses filled to the brim with obstacles to jump, slide, kick, grind, glide, and dance through. Boss battles are still as ridiculous and inventive as ever. Rhythm comes into play via your actions. Every move plays a small chime upon successful execution, adding notes and dimension to the simple underlying track. Collecting cores – large red objects that look like plus signs – increases the tempo, taking the tune from quiet and understated to loud and pronounced. By the end of each level, what was once a one-note looping theme becomes a complex chiptune symphony: the perfect reward for your hard work. The base tracks change slightly from world to world, your actions making each level’s soundtrack different from one another. Mastering Runner 2 remains an exercise in trial and error. Levels are packed tightly with obstacles aplenty. 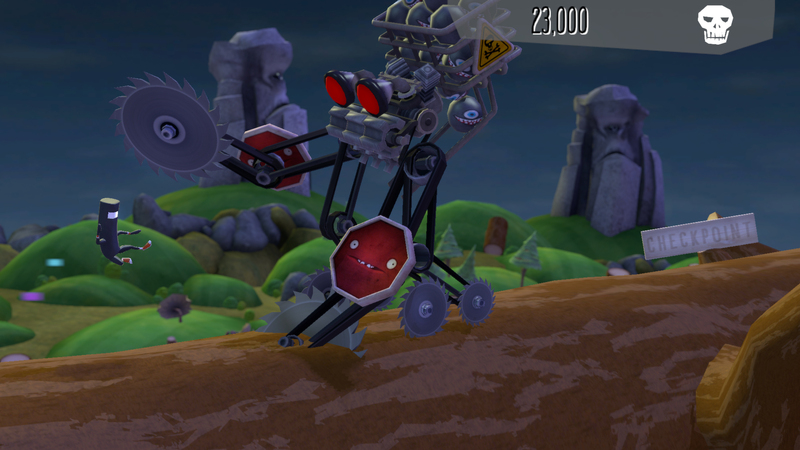 Robots of varying sorts act as the overarching foe, their positions indicating whether you should jump over or slide under or jump-slide through them. Getting the timing down proves difficult, the speed at which CommanderVideo moves not nearly slow enough spend even a second to process what lies ahead. All you can do is react and hope judged your jump correctly. You will fail – a lot. And with each attempt a little more progress is made. It’s tough work, but the payoff is immense. It’s trial and error at its best, acting as a learning tool instead of a cheap, persistent road-block. And if it’s too hard, lower the difficulty setting and lessen the amount of obstacles and their distance between one another or activate one of the many checkpoints found along the way. Skipping checkpoints awards a massive sum of points at the cost of saving you time and energy getting back there should you fail. Runner 2 is far more accessible than its brethren. Checkpoints have appeared in past Bit.Trips, but not in such a smart manner. Before, they were always forced upon you. In Runner 2, they’re completely optional. Bust through them to make the levels less punishing or jump over them for an additional surplus of points, lending a much welcome risk-versus-reward factor. It’s the perfect balance between accessibility and challenge, never sacrificing the series principles in pursuit of it. To mix matters up, Runner 2 contains eight playable characters than range from the wrong (the reverse merman) to the pedestrian (a tin-man) and an embarrassment of costumes. All for aesthetics, of course – none of the characters play differently, nor do the costumes do anything. Only difference is in their animations, each lending the cast their own little identity. 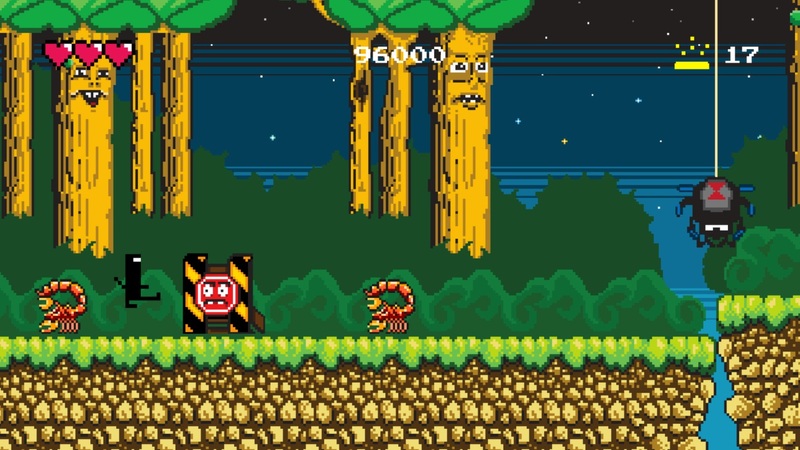 Costumes are unlocked by grabbing chests hidden in certain levels, often behind lock and key, the latter of which is obtained through playing the level where the key safe is. Instead of strict, linear progression, Runner 2 is separated into five worlds, each displayed via a world map of sorts. Branching paths house side-levels accessed both through collecting enough gold to remove roadblocks and by exiting through alternate exits. Levels frequently offer branching paths, one being noticeably harder than the other. The harder paths are indicated by red arrows and often hide chests and better point gathering opportunities, whist green indicates an easier path, and blue designating alternate exits. Additionally, gold cartridges are cleverly hidden throughout, each taking you to a special bonus level resembling a Super Nintendo game. The points earned there have no bearing on those granted in the level before, however; they’re standalone courses this time around. Retro levels ooze with charm and grant a significant challenge. All this serves to make revisiting levels a far more incentivized venture, whether it be merely for collecting extras or pursuit of high scores. The addition of leaderboards adds some much needed competition. Gone are the “perfect scores” – a single highest possible score – that barred the feature’s inclusion before in favor of a more traditional model. Diverging paths and the new dance move (easily the best and silliest addition) facilitate this by awarding points for deftly navigating tougher gantlets and by pulling off successful dance moves. Finding moments to execute them amongst all the athletics, however, is difficult to say the least. Though the art style looks great and the game moves fluidly, the scenery is often uninteresting. Sea-side vistas and dense forests present few reasons to take in the environments. The water-side world especially so, as the most you see are a couple massive barrels in the distance, nothing but empty sea in between. Save for the final world, which brings back the wonder and distraction of past Bit.Trips gloriously, the locales are dull and lifeless, offering nothing of value to the proceedings. Bit.Trip Runner was already a marvelous evolution of the otherwise basic auto-scrolling platformer. But Runner 2: Future Legend of Rhythm Alien manages to take that evolution further, taking an already superb game and improving it in all the right ways. Runner 2 is a spectacular follow-up and easily the best Bit.Trip game around.